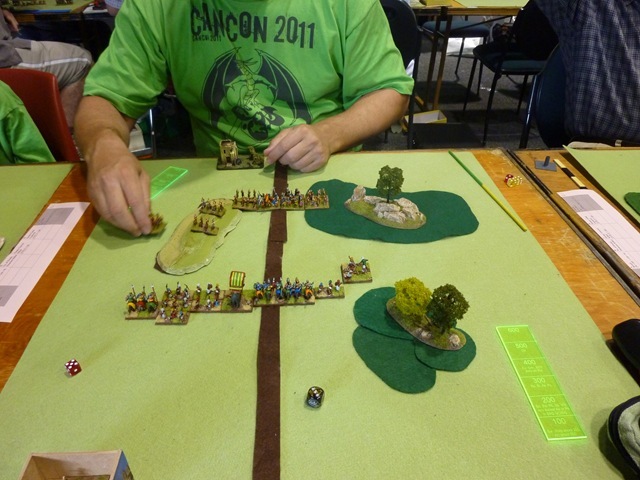 I came second at Cancon 2011 in the DBA competition. I was staying with Doug for that weekend and Doug had won the competition. However, for the first and second place getters, we had not played over the six games of the competition so I maintained that the only reason Doug had won was that he hadn’t played me. 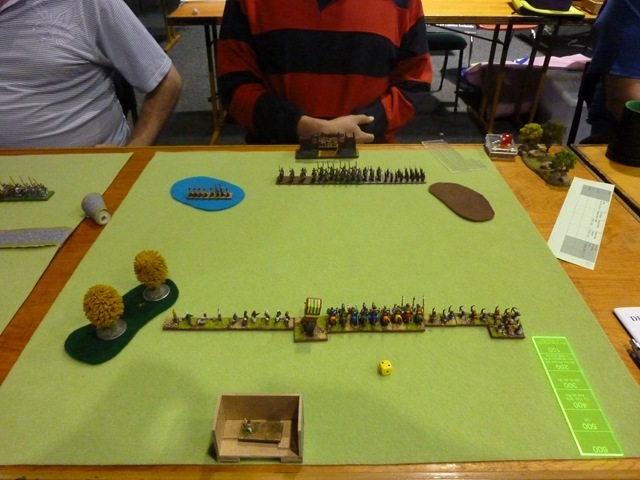 We got around to playing the final final on Saturday the 12 of November … 10 months after Cancon 2011 had finished. 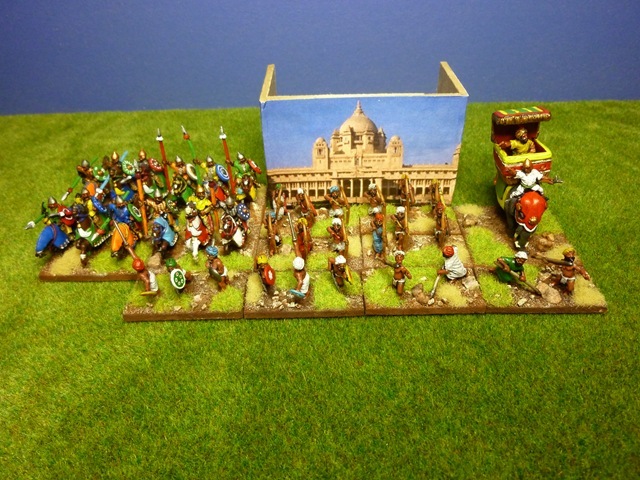 I took the mighty Rajputs out for one final outing against Doug’s DBA v2 army, IV/30 Teutonic Orders. The photograph above shows the two armies after deployment. The Rajputs took the elephant out for a final jaunt along with three knights, two blades, two Psiloi and 4 Bows. The Teutonic Orders were four knights (one a general), one Cavalry, two light horse, one spears, two crossbows, a psiloi and an auxilia element. Doug was well into his cups at this stage and so the fog of war was thick. I had decided that to be fair, I should also attempt to increase said fog so dived into a couple of Jim Beam’s with cola. We rolled and I was the defender. The game balance moved to and fro, favouring first one of us then the other. 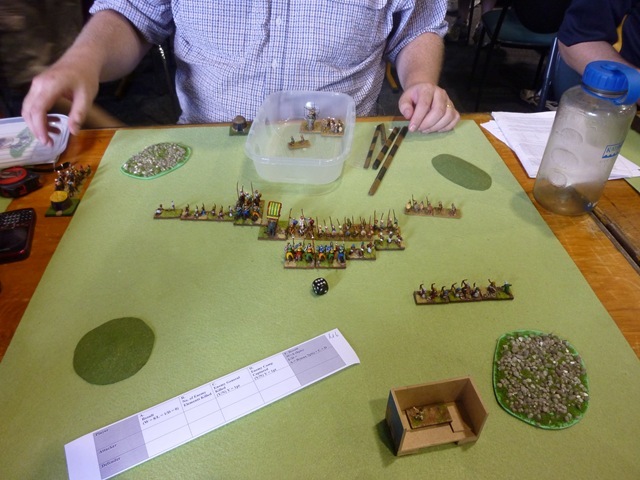 During the DBA competition time was called at 45 minutes but at that time the game here hung in the balance so being the incredibly generous bloke that I am, I kept playing instead of taking the draw (with a slight points win in my favour at that point). We were hanging in the balance, me with three elements gone, Doug with three elements gone. We rolled on the last bound, I lost my fourth element. The next combat saw Doug’s general eliminated – 4 elements each and his general gone. 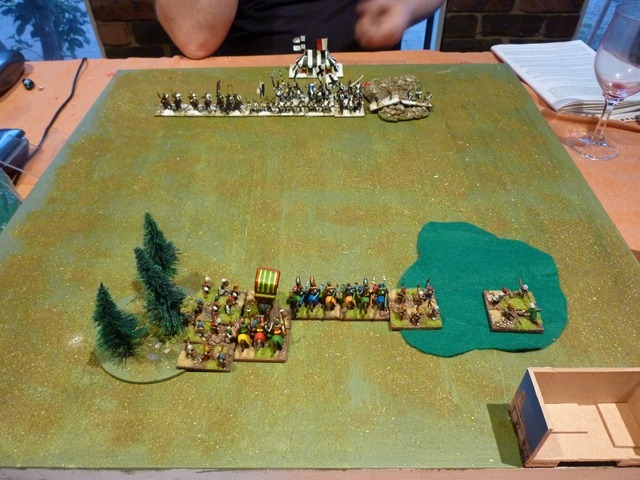 There was one final combat to go – his light horse against my blades – 2-2 in factors. We rolled – I rolled one and Doug rolled 4. A 6-3 result his way and the death of the blades resulting in a 5-4 win to Doug. 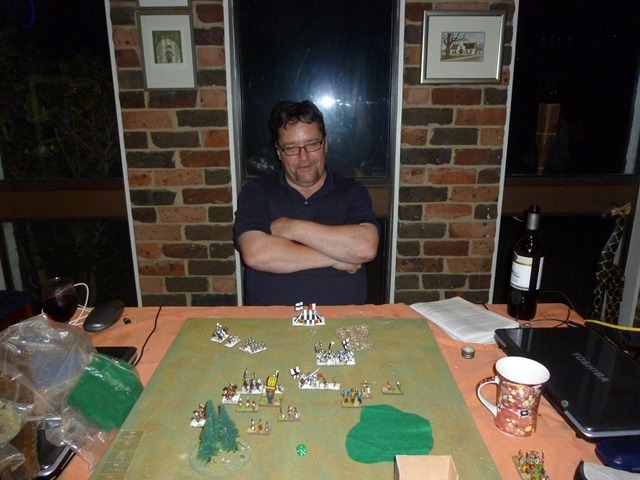 So, in what can only be described as scraping a win in extra time, Doug managed to defeat the mighty Rajputs to be the undisputed DBA champion from Cancon 2011. The last battle – round 6. For this round I had drawn Adrian Williams and his Samanids (“Sama-what’s” said I, “Samanids” said he). I could not find that list easily in the rules so thought “what the heck, let’s just deploy and see what turns up”. In fact the list Adrian was using was list III/43c Khurasanian (Samanids). For the record, the Samani dynasty, also known as the Samanid Empire, or simply Samanids (819–999 CE) was a Persian state in Central Asia and Greater Iran. Its borders crossed over modern day Iran, Kazakhstan, Uzbekistan, Takjikistan and the other ‘stans. It is named after its founder Saman Khuda, who converted to Sunni Islam despite being from Zoroastrian theocratic nobility. It was the first native Persian dynasty in that area after the collapse of the Sassanian empire caused by the Arab conquest. 1 x 4Ax – some poor terrain troops. Adrian had played Doug in the previous round so after 4 rounds had been scoring well, this was going to be another tough battle. I took the elephant general option – to give myself three games with and three games without the elephant general. For the third time after lunch, I rolled high on aggression so once again I was the attacker. Adrian laid out the terrain (which looked suspiciously like the terrain he laid for his battle with Doug). We deployed and battle commenced. I deployed by bows and psiloi on both flanks, with my knights and elephant in the centre, and my blades to the right of the knights. I was attempting to put as much punch as possible up the clear centre of the table and keep the bows back and out of trouble. Facing that Adrian had his centre filled with his cavalry and spears whilst his other troops were on the flanks and looking to cause as much trouble as possible with my weakened flanks. My tactics here were simple – get the centre in and mixing it as soon as possible. We advanced. Some good combat results had the Saminids down three elements when the jumbos clashed. It was mano-a-mano (or rather pachyderm-a-pachyderm) in the centre as the two elephants faced off against each other. Both elephants were overlapped so the combat came down to Samind Elephant with a factor of 4 (5 vs elephant minus 1 overlapped) vs the Rajput elephant 5 (5 vs elephant minus 1 overlapped plus 1 general in combat). The dice were rolled and Adrian rolled 1, I rolled 5 for a total difference of 10 to 5 and the Saminid elephant was eliminated. Final result was and 8:1 victory to me and overall second place in the competition. 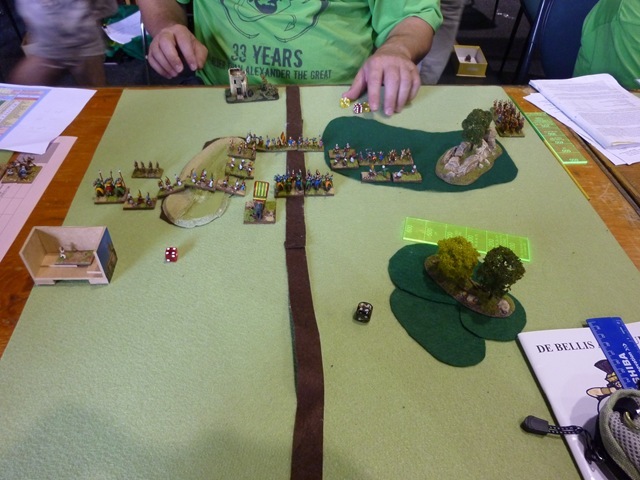 Game three saw me pitted against Chris Hersey and army II/33 Polybian Roman. 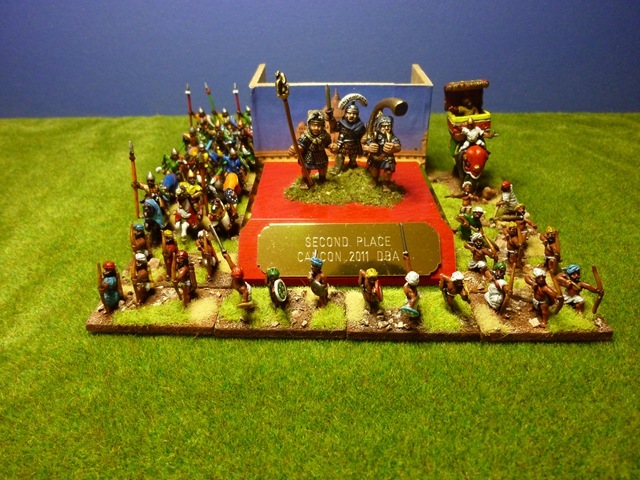 2 x 2 Ps – the velites – some light troops to both back the triarii and work the bad going. Once again, I rolled low on the aggression dice (his aggression factor is 1 to start with whilst mine is 2) so I ended up being the defender again. I placed the now obligatory wood, rough ground and boggy ground, Chris rolled for sides, deployed and then waited for me. I had decided this time to take the all knight option so my general was mounted on a horse for this game rather than his elephant. I’d decided that over the six games I’d use the elephant general three times and the knight general for the other three games. We advanced on each other. I’d deployed my blades in the boggy ground on my left flank to protect the archers coming forward and my psiloi on the right where the rough ground was near to where I expected to encounter the Romans. My bows, with the blades supporting were facing blades but the knights were facing his cavalry, general and some blades. My Psiloi would eventually ensure that his spears did not get at my knights. My blades moved forward to cover the bows (who were really not going to get involved in this fracas at all). We finally closed and after some melees that saw some of my knights recoil, Chris then lost an element of blades and this evened out the combat between generals. I rolled well, he didn’t and the result was his general becoming hors de combat and it was game over. Another 8:1 victory to me. Another general eliminated. The photo to the right is the conclusion of this game. It was now lunchtime and after three rounds I had amassed 18 points from a possible 24. This apparently saw me in the top part of the middle of the field and meant that after lunch I would be facing a number of other two game winners, including some more very good DBA players from the Canberra area. Canberra has about 4 DBA tournaments a year so the players there are quite experienced. I started my first competition at Cancon 2011 on Saturday and finished the DBMM v2.0 competition today. I didn’t win. However, that is not important. I had a really good time playing wargames with people who were friendly and helpful to me, the newbie. I have played four games over the last two days. Each game lasted about 3 hours 45 minutes and I will post after action reports later on each of the games. In the meantime, I would like to thank Dave Turned, Zac Russell, Dave Quilty and Rod Somerville for being helpful and friendly as opponents. Zac Russell Book II, List 80 Hunnic 6:19 Loss Zac helped with me learning some of the mechanics of moving Irregular mounted knights. Rod Somerville Book II, List 32 Later Carthaginian 1:24 Loss A game where we each expected to do well and did badly and where we expected to do badly, did well! Overall, it was a great two days and I thank each of my opponents for the pleasant games (and in Dave Quilty’s case, the coffee). I should note that there were 21 competitors and I finished 11th – behind 10 and in front of 10. My opponents included the eventual second place winner and the eventual fourth place getter. My final score was 49/100 – the same score that Dave Turned finished on – so as you can see, I was not hiding behind weak players. If I can arrange it, I will be back next year, but before that, I have a DBA competition of six games later today.